In Lesson 5 of the Basic HTML tutorials we showed how to emphasise text using the </em> and </strong>. In this lesson we introduce a lot more tags that change the appearance of our text. The <cite> tag and its' closing </cite> tag are used to define a citation within our text. 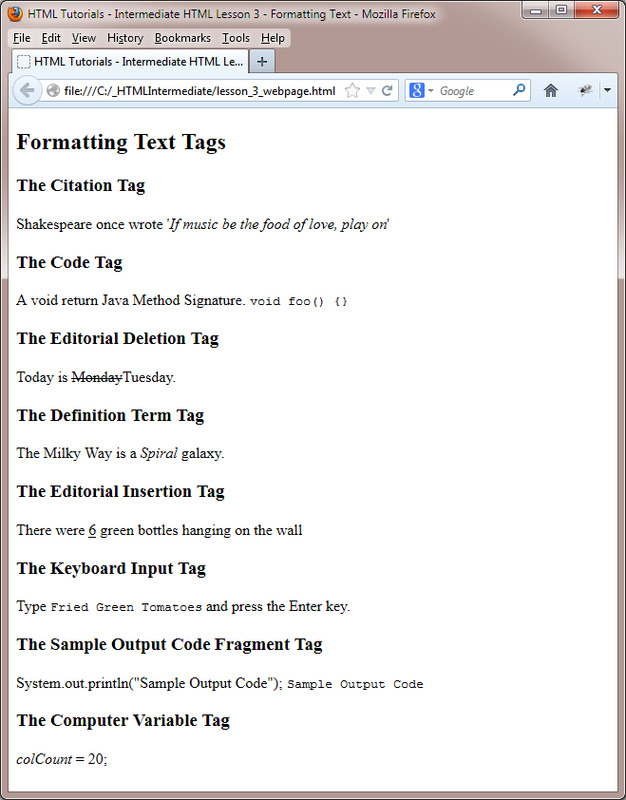 The <code> tag and its' closing </code> tag are used to define computer code fragment within our text. The <del> tag and its' closing </del> tag are used to define an editorial deletion within our text. The <dfn> tag and its' closing </dfn> tag are used to define a definition term within our text. The <ins> tag and its' closing </ins> tag are used to define an editorial insertion within our text. The <kbd> tag and its' closing </kbd> tag are used to define text to be entered by the user within our text. The <samp> tag and its' closing </samp> tag are used to define a sample output code fragment within our text. The <var> tag and its' closing </var> tag are used to define a computer variable within our text. Wow! That's a lot of tags and the best way to understand them is to see what effects they have on our text. Copy and paste the following code into the reopened file, overwriting the existing contents. Save the file in the C:\_HTMLIntermediate folder as lesson_3_webpage.html and close the Notepad. From the C:\_HTMLIntermediate folder, double click on the saved file and it will appear in your default web browser and look something like the following image. There are subtle differences in some tags and others just look italicized. Similar effects can be achieved with a little CSS but these tags can cut down on CSS definitions and have their place in HTML. Play around with the HTML code and see the different effects you get with these tags. In the next lesson we take a final look at lists by creating definition lists.